Yamaha’s WX-AD10 multiroom adaptor warrants a hi-fi high five – it’s a gorgeous Hi-Res Audio streaming upgrade for legacy amps and music systems. With the WXAD-10 you can turn any non-network audio gear into a fully-functional multiroom wireless component. If you have a regular two channel amplifier, all-in-one music system or legacy AV receiver, this is all you need to get them online. As a gizmo, the WXAD-10 isn’t unique. Google's ChromeCast Audio dongle does much the same thing for considerably less, but it's not a portal to Yamaha's proprietary MusicCast system – and it certainly doesn't have comparable audiophile chops. Yamaha likes to refer to the WXAD-10 as 'the Add', a cute monicker that sums up what it does – you use it to add kit to a MusicCast multiroom system, or provide a stepping on point to add more later. It’s compact at just 130 x 45 x 106 mm. (w/h/d). Not much bigger than a media player, the little puck can be sit beside or atop your chosen Hi-Fi. The WXASD-10 is finished in a matte grey, with curvy corners and a little LED strength meter on the front fascia. It's nicely made, even down to a quarter of rubber feet. On the rear is a pair of stereo phono outputs and a 3.5mm minijack. There's also an Ethernet LAN connector if you don’t want to go wireless and a USB 5v power port. The adapter also offers Bluetooth. Inside there’s a Burr-Brown PCM5121 DAC and Yamaha designed network module, which contains a high precision low-jitter clock to optimize the quality of streamed audio, be it across a network or over Bluetooth. As befits an adapter, installation is quick and straightforward. Using the Connect button on the underside, you simply pair it to the MusicCast Controller app, and then gift over your Wi-Fi password. Voila, the WXAD-10 becomes your new network source. The WXAD-10 can be renamed to best reflect the room it's in; you can even assign an image to its profile, either from a library of picture perfect showrooms or an actual snap of its location taken on your phone. For this audition, we connected the WXAD-10 to an AV receiver, just as we would any other stereo source. We’ve auditioned a fair number of MusicCast components and they tend to very in terms of network stability. This adapter proves a reliable proposition though. The MusicCast Controller allows you to stream a variety of top services: Spotify, Tidal, Deezer, Napster, Qobuz and TuneIn. Music libraries on NAS devices are accessible too (the adapter is DLNA compliant). There's also AirPlay on hand for Apple users. Used with streaming audio services, the WXAD-10 sounds perfectly fine. But it really comes into its own when playing High-Res Audio from a NAS. Claire Martin’s tango-infused arrangement of Bowie’s The Man Who Sold The World (24-bit 192kHz Studio Master, Linn Records), sounds immaculate. There’s vinyl warmth to its presentation which is joyous. The WXAD-10 will play uncompressed WAV, FLAC and AIFF in 192kHz 24-bit resolution, as well as ALAC at 96 kHz 24-bit. However the WXAD-10 is unable to play DSD files of any description. Of course, there’s more to the WXAD-10 than local streaming. It allows users to draft their newly networked kit into a MusicCast ecosystem. You can stream to the adaptor, or group it with other compatible components. 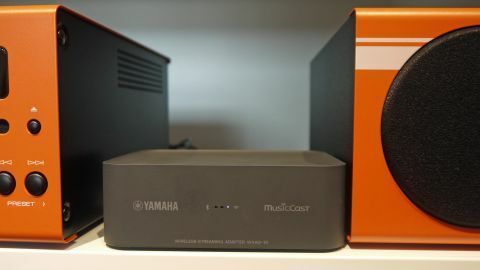 And the appeal of MusicCast over rival multiroom platforms is the sheer variety of audio hardware which you can network. The WXAD-10 isn’t just a simple way to upgrade any audio kit to wireless streaming, it’s also an excellent audio source in its own right, particularly when used to play 24-bit High-Res Audio. Value for money is ultimately a question of perspective. Sure you can pay less to add streaming functionality to non-Smart hi-fi, but if you have a high-end audio system that predates wireless streaming, that ticket price could look like a bargain. Compact design and ease of use are reason enough to enthuse about the WXAD-10. But there's more to like than that. Yamaha has used a high-quality DAC and applied audiophile circuitry design to reduce jitter, resulting in a beautiful sounding wireless streamer, with presence and smooth fluidity. A lack of DSD file compatibility takes some shine off its Hi-Res Audio credentials. While Amazon Alexa support is incoming, the WXAD-10 won’t work with Google Home. Easy to install, nicely designed and blessed with a great sounding DAC, the WXAD-10 is a great way of getting a non-connected audio components online. Even if you don’t want to invest into a fully fledged MusicCast network, it’s talented enough in its own right to shortlist. Its performance more than warrants any price premium over dirt cheap dongles.